1- Select your items and click "Add to Cart" for each item you'd like to purchase. 2- You can "Continue Shopping" or check out from the invoice page! We allow purchases using PayPal only! To download entire sales brochure, go to "files" at the bottom of this page! Small Autism Puzzle Piece Necklace ~ $10.00 ea. These autism awareness necklaces have a elegant sterling silver plated puzzle piece charm on a beautiful sterling silver wave chain that has a lobster clasp. This necklace is 20 inches long and the puzzle piece charm is 1.5 cm x 1.2 cm. Silver Puzzle Piece Keychain ~ $8.00 ea. 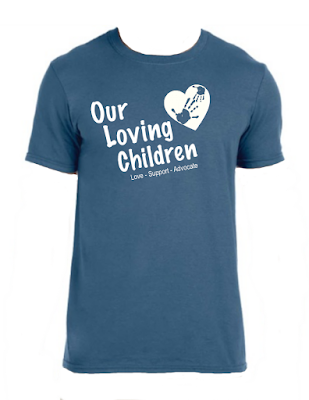 Our Loving Children -shirt ~ $15.00 ea. These autism awareness "Our Loving Children" t-shirts are in a beautiful blue and depict the white heart with adult and child that symbolize the helping hand showing that we can all do this together!